It’s that special day of the week my friends and this time it’s a robust, tangy, vinegar based BBQ sauce for all of you eastern NC style lovers out there. I gave the product 4/5 stars in January and I just love the vintage label of this. Today we’re going to have 5 WINNERS! Yes, 5 people win a bottle of sauce! Like the creator of this sauce Pigtail Brands on Facebook and (tell em BBQ Sauce Reviews sent you)! I’m sure that if we would go way back to that talking horse!!! ” Big Ed ” would love to promote this sauce!!!! The optimal use for Big Ed’s is one some pulled pork. A horse is a horse, of course, of course, And no one can talk to a horse of course. That is, of course, unless the horse is the famous Mr. Ed. Whoops wrong Ed. Sorry Big Ed. 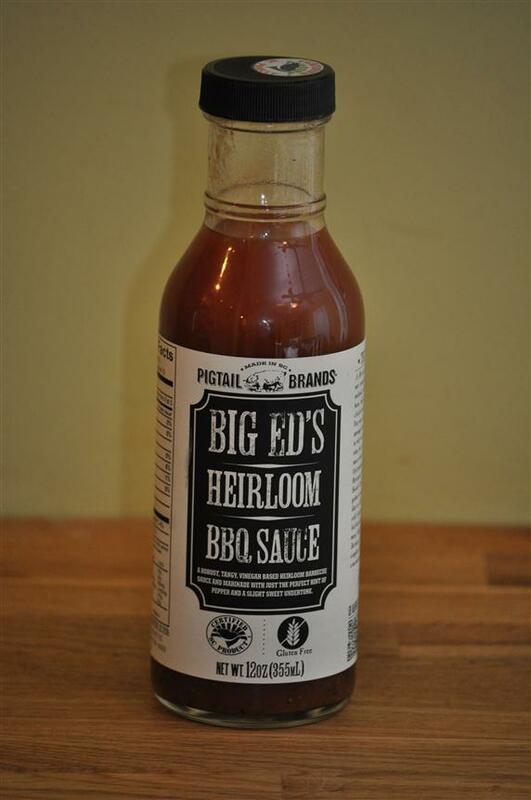 I would like to try Big Ed’s BBQ sauce on my husband Big Krys’ BBQ this week-end!! Bring on some pork! Big Ed………Its whats for Chicken!!! Going fly fishing with Big Ed’s Fishing Ventures in Breckenridge, CO. So need some Big Ed’s sauce for the cookout afterwards. Big AL would like to try Big Ed’s sauce. My BigGreen Egg needs some Big Ed’s BBQ sauce!!! Love to try some Big Ed’s!!! Big Ed’s…that’s all the sauce I need! I’m sure BIG ED’s sauce is delicious and I would love to try it!!! BIG ED’S would go over BIG at the BIG sergeants BIG backyard BBQ!! I hope Big Ed likes Big Flavor. Is BIG ED related to my husband BIG AL? He’ll get to fire up the BBQ for Father’s Day! and that’s how he got to earn the name…Big Ed! Cant wait to give this vinegar based Big Eds BBQ sauce my stamp of approval! Can’t wait to try Big Ed ! Big Ed’s in the house! Would love to try it. Thanks for the opportunity. Cheers! Big Ed’s sauce is good for the soul. HELL!!! Some of my friends call me “BIG ED”! BIG ED is all I need for my BBQ!! Liked the Facebook page and left a comment….I think Big Ed would be proud of my efforts. I will be sure to spread the sauce of Big Ed on my pork and bread. I get the Bg Head when people brag about my BBQ and it’s all because of Big Ed’s Heirloom BBQ Sauce! My daddy would love to have “Big Ed” over for a BBQ on Father’s Day! Looking to taste test some “Big ED’s” Sauce soon. My husband and I would love to try some Big Ed’s BBQ sauce! I will be reaching out to you to get your address.